One of the Wichita area’s preferred senior living communities, we offer a place in which you are free to continue the lifestyle to which you are accustomed. We understand that a well-lived, well-enjoyed life is one full of choices. We invite you to choose a living space that reflects your needs and make it your own. Every day begins and ends with beautiful accommodations, a maintenance-free lifestyle with a world of amenities just outside your door. Many of our services are complimentary for all community members. Most utilities, bi-weekly housekeeping and so much more are all part of your monthly fee. And we encourage you to make your home truly yours, to create a space that reflects your personal sense of style. Your day continues, engaging in personal enrichment activities is a significant part of a well-rounded life. At Larksfield Place we provide a rich array of opportunities to continue your life-long quest for learning. Galleries and art exhibits, concerts, seasonal celebrations, seminars and other special events offer a multitude of entertainment options. Making healthy choices is easy here. Choose our fine dining restaurant or snack bar and indulge a little or a lot. Follow personalized exercise plans at our fitness club. You can relax knowing the Supportive Health Services and Health Care Center offers tender loving care if and when you need it. Enjoy a true Life Care program, a financial and estate-planning benefit that adds to your peace of mind and is a tremendous value. 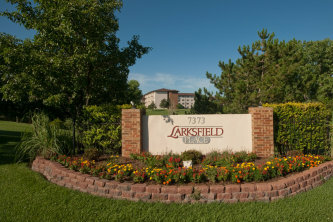 Larksfield is a friendly place, where your neighbors, some of whom you may already know, represent some of the most accomplished and personable people you may ever meet. You and your family are invited to visit us for a personal tour of all that Larksfield Place offers. Please call us for more information, or to schedule a visit.